Thurman Lee Munson (June 7, 1947 – August 2, 1979) was an American Major League Baseball catcher. He played his entire 11-year professional baseball career for the New York Yankees (1969–1979). A perennial All-Star, Munson is the only Yankee to win both the Rookie of the Year and Most Valuable Player awards. Born in Akron, Ohio, Munson was selected as the fourth pick of the 1968 Major League Baseball draft. Munson hit over .300 in his two seasons in the Minor Leagues, establishing himself as a top prospect. He became the New York Yankees' starting catcher late in the 1969 season. Munson played his first complete season in 1970, and was voted A.L. Rookie of the Year after hitting .302. Considered the "heart and soul" of the Yankees, Munson was named the first team captain since Lou Gehrig. He led the Yankees to three consecutive World Series appearances from 1976 to 1978, and two consecutive World Series championships in 1977 and 1978. In 1979, Munson died at the age of 32 while practicing landing his Cessna Citation at Akron–Canton Airport. Munson suffered a broken neck as result of the crash, and his cause of death was asphyxiation. His two companions escaped the burned aircraft. Munson was born in Akron, Ohio to Darrell Vernon Munson and Ruth Myrna Smylie, the youngest of four children. His father was a World War II veteran who became a truck driver while his mother was a homemaker. When he turned eight, the Munson family moved to nearby Canton, Ohio. He was taught how to play baseball by his older brother Duane, and usually played baseball with kids Duane's age, who were four years older. His brother left to join the United States Air Force while Thurman was a freshman in high school. He attended Lehman High School in Canton, Ohio, where he was captain of the football, baseball and basketball teams and was all-city and state in all three sports. Munson played halfback on the football squad, guard on the basketball squad, and mostly shortstop in baseball. Munson switched to catcher in his senior year in order to handle the pitching prowess of his teammate, Jerome Pruett (a fifth-round draft pick of the St. Louis Cardinals in 1965 who never reached the Major Leagues). He attracted scholarship offers from various colleges. He opted to attend nearby Kent State University on scholarship, where he was a teammate of pitcher and broadcaster Steve Stone. In the summer of 1967, Munson joined the Cape Cod Baseball League, where he led the Chatham A's to their first league title with a prodigious .420 batting average. In recognition of this achievement and his subsequent professional achievements, the Thurman Munson Batting Award is given each season to the League's batting champion. Munson was selected by the Yankees with the fourth overall pick in the 1968 Major League Baseball draft. In his only full minor league season, he batted .301 with six home runs and 37 runs batted in for the Binghamton Triplets in their final season (1968), and made his first appearance in Yankee Stadium in August 1968, when the Triplets came to play an exhibition game against the Yankees. He was batting .363 for the Syracuse Chiefs in 1969 when he earned a promotion to the New York Yankees. Munson made his major league debut on August 8, 1969, in the second game of a doubleheader against the Oakland Athletics. Munson went two for three with a walk, one RBI and two runs scored. Two days later, his first major league home run was the second of three consecutive home runs hit by the Yankees off Lew Krausse in a 5-1 Yankee victory over the A's. For the season, Munson batted .256 with one home run and nine RBI. He made 97 plate appearances, but drew ten walks and had one sacrifice fly, which gave him 86 official at bats, and allowed him to go into the 1970 season still technically a rookie. The Yankees used the pair of Jake Gibbs and Frank Fernández at catcher for most of 1969. During the off season, the Yankees dealt Fernández to the A's to make room for their rising star behind the plate. Munson responded by batting .302 with seven home runs and 57 RBI, and making 80 assists en route to receiving the 1970 American League Rookie of the Year award. Munson received his first of seven All-Star nods in 1971, catching the last two innings without an at-bat. An outstanding fielder, Munson committed only one error all season. It occurred on June 18 against the Baltimore Orioles when opposing catcher Andy Etchebarren knocked Munson unconscious on a play at the plate, dislodging the ball. He also only allowed nine passed balls all season and caught 36 of a potential 59 base stealers for a stellar 61% caught stealing percentage. Munson was known for his longstanding feud with Boston Red Sox counterpart Carlton Fisk. One particular incident that typified their feud, and the Yankees – Red Sox rivalry in general, occurred on August 1, 1973 at Fenway Park. With the score tied at 2–2 in the top of the ninth and runners on first and third, Munson attempted to score from third on Gene Michael's missed bunt attempt. As Red Sox pitcher John Curtis let his first pitch go, Munson broke for the plate. Michael tried to bunt, and missed. With Munson coming, Fisk elbowed the Yankee shortstop out of the way and braced for Munson, who barreled into Fisk. Fisk held onto the ball, but Munson remained tangled with Fisk as Felipe Alou, who was on first, attempted to advance. The confrontation at the plate triggered a ten-minute bench-clearing brawl in which both catchers were ejected. Munson made his second All-Star team and won his first of three straight Gold Glove Awards in 1973. He also emerged as more of a slugger for the Yankees, batting .300 for the first time since 1970, and hitting a career high twenty home runs. In 1974, Munson was elected to start his first of three consecutive All-Star games, going one for three with a walk and a run scored. Munson batted a career high .318 in 1975, which was third in the league behind Rod Carew and Fred Lynn. For the start of the 1976 season, Munson was named the first Yankees team captain since Lou Gehrig retired in 1939. He responded by batting .302 with 17 home runs and 105 RBI to receive the American League MVP Award and lead the Yankees to their first World Series since 1964. He batted .435 with three RBI and three runs scored in the 1976 American League Championship Series against the Kansas City Royals, and batted .529 with two RBI and two runs scored in the 1976 World Series against the Cincinnati Reds. Already down three games to none, Munson went four for four in the final game of the Series at Yankee Stadium to try to avoid a sweep to the "Big Red Machine." Combined with the hits he got in his final two at bats in game three, his six consecutive hits tied a World Series record set by Goose Goslin of the Washington Senators in 1924. Reds catcher Johnny Bench was named World Series MVP. A fairly obvious comparison of opposing backstops was made to Reds manager Sparky Anderson during the post-World Series press conference, to which, Anderson responded, "Munson is an outstanding ballplayer and he would hit .300 in the National League, but you don't ever compare anybody to Johnny Bench. Don't never embarrass nobody by comparing them to Johnny Bench." Munson was visibly upset by these comments when he got on the mic shortly afterwards. Munson batted .308 with 100 RBI in 1977, giving him three consecutive seasons batting .300 or better with 100 or more RBI each year. He was the first catcher to accomplish the feat in three consecutive years since Yankee Hall of Famer Bill Dickey's four straight seasons from 1936-1939, matched only by Mike Piazza since (1996–1998). The Yankees repeated as American League Champions, and faced the Los Angeles Dodgers in the 1977 World Series. Munson batted .320 with a home run and three RBI in the Yankees four games to two victory over the Dodgers. The Dodgers had stolen 114 bases during the regular season, yet Munson caught four of six potential base stealers in the first four games of the series to keep the speedy Dodgers grounded in the final two. The Yankees and Royals faced each other for the third consecutive time in the 1978 American League Championship Series. With the ALCS tied at a game apiece, and trailing 5–4 in the bottom of the eighth inning of game three, Munson hit the longest home run of his career, a 475-foot shot off Doug Bird over Yankee Stadium's Monument Park in left-center field, to give the Yankees a 6–5 win. They won the pennant the next day, and went on to beat the Dodgers again for the 1978 World Series Championship. Munson batted .320 (8-for-25) with 7 RBI's in this Series and also caught Ron Cey's foul pop-up for the final out. Brad Gulden (with Billy Martin and Catfish Hunter) was one of two catchers to play in the game after Thurman Munson's funeral. His black memorial armband is visible. 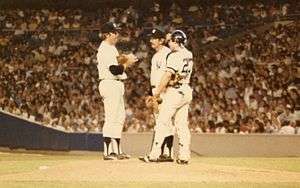 The Yankees had lost three in a row, and were in fourth place, eleven games behind the Baltimore Orioles in the American League East heading into the All-Star break in 1979. Despite a .288 average, the wear-and-tear of catching was beginning to take its toll on Munson, and he was overlooked for the American League All-Star team. Frequently homesick, he had a well-known desire to play for the Cleveland Indians in order to be closer to his family, and was also considering retiring at the end of the season. Munson had been flying for over a year and purchased a Cessna Citation I/SP jet so he could fly home to his family in Canton on off-days. On August 2, 1979, he was practicing takeoffs and landings at the Akron-Canton Regional Airport with friend Jerry Anderson and flight instructor Dave Hall. On the fourth touch-and-go landing, Munson allowed the aircraft to sink too low before increasing engine power, causing the jet to clip a tree and fall short of the runway. The plane then hit a tree stump and burst into flames  on Greensburg Rd., 870 feet short of runway 19. Hall and Anderson both survived the accident. Hall received burns on his arms and hands, and Anderson received burns on his face, arm and neck. Munson suffered a broken neck and would have most likely been a quadriplegic had he lived. Munson died of asphyxiation due to the inhalation of superheated air and toxic substances. The NTSB investigation into the crash stated that the probable cause was "...the pilot's failure to recognize the need for, and to take action to maintain, sufficient airspeed to prevent a stall into the ground during an attempted landing. The pilot also failed to recognize the need for timely and sufficient power application to prevent the stall during an approach conducted inadvertently without flaps extended. Contributing to the pilot's inability to recognize the problem and to take proper action was his failure to use the appropriate checklist and his nonstandard pattern procedures which resulted in an abnormal approach profile." Thurman Munson's number 15 was retired by the New York Yankees in 1979. The day after his death, before the start of the Yankees' four-game set with the Baltimore Orioles in the Bronx, the team paid tribute to their deceased captain in a pre-game ceremony in which the starters stood at their defensive positions, save for the catcher's box, which remained empty. Following a prayer by Cardinal Terence Cooke, a moment of silence and "America the Beautiful" by Robert Merrill, the fans (announced attendance 51,151) burst into an eight-minute standing ovation. Jerry Narron, the man who would replace Munson behind the plate that night, remained in the dugout and did not enter the field until stadium announcer Bob Sheppard said, "And now it is time to play ball. Thank you, ladies and gentlemen, for your co-operation." On August 6, the entire Yankee team attended Munson's funeral in Canton, Ohio. Teammates Lou Piniella and Bobby Murcer, who were Munson's best friends, gave eulogies. That night (before a national viewing audience on ABC's Monday Night Baseball) the Yankees beat the Orioles, 5-4, in New York, with Murcer driving in all five runs with a three-run home run in the seventh inning and a two-run single in the bottom of the ninth. Our captain and leader has not left us, today, tomorrow, this year, next ... Our endeavors will reflect our love and admiration for him. Munson's locker in the New York Yankees Museum, 2009. The locker that Munson used, along with a bronzed set of his catching equipment, was donated to the Baseball Hall of Fame. Despite a packed clubhouse, Munson's final locker position was never reassigned. The empty locker next to Yankee team captain Derek Jeter's, with Munson's number 15 on it, remained as a tribute to the Yankees' lost catcher in the original Yankee Stadium until the Stadium closed in 2008. Munson's locker was moved in one piece to the New Yankee Stadium. It is located in the New York Yankees Museum. Visitors can view the Yankees Museum on game days from when the gates open to the end of the eighth inning and during Yankee Stadium tours. Munson's number 15 is also displayed on the center-field wall at Thurman Munson Stadium, a minor-league ballpark in Canton. Munson is buried at Canton's Sunset Hills Burial Park. A modest, one-block street at Concourse Village East and 156th Street in The Bronx was named Thurman Munson Way in 1979. Two school buildings, which house several schools including Henry Lou Gehrig Junior High School, have since been built on the street. On August 1, 1980, the day before the first anniversary of the accident, the Yankees filed a $4.5-million lawsuit against Cessna Aircraft Co. and Flight Safety International, Inc. (the company who was training Munson to fly), with team spokesman John J. McCarty saying "we asked for $4.5 million because that is what Munson would be worth if the Yankees traded him." Munson's widow, Diana, also filed a $42.2 million wrongful death lawsuit against the two companies. Cessna offered Munson a special deal on flying lessons if he would take them from FlightSafety International. Rather than requiring Munson to take a two-week safety class in Kansas, FlightSafety assigned a "traveling instructor" to go on the road with him, and train him between ballgames. The suit was eventually settled out of court. In September 1968, Munson married Diana Dominick at St. John's Church in Canton. He is survived by Diana and their three children: daughter Tracy, daughter Kelly and son Michael. Diana Munson would throw out the ceremonial first pitch at Game 3 of the 1997 World Series in Cleveland, Ohio. Munson had a career .357 batting average in the postseason with three home runs, 22 RBI and 19 runs scored. His batting average in the World Series was .373. Munson threw out 44.48% of base runners who tried stealing a base on him, ranking him 11th on the all-time list. ↑ "Cape Cod Baseball League Thurman Munson Award Winners". Retrieved 2009-11-25. ↑ "New York Yankees 5, Oakland A's 0". Baseball-Reference.com. 1969-08-08. ↑ "New York Yankees 5, Oakland A's 1". Baseball-Reference.com. 1969-08-10. ↑ "1971 All-Star Game". Baseball-Reference.com. 1971-07-13. ↑ "Baltimore Orioles 6, New York Yankees 4". Baseball-Reference.com. 1971-06-18. ↑ "The Munson/Fisk Rivalry". Retrieved 2009-11-25. ↑ "Boston Red Sox 3, New York Yankees 2". Baseball-Reference.com. 1973-08-01. ↑ "1974 All-Star Game". Baseball-Reference.com. 1974-07-23. ↑ "1978 American League Championship Series Game Three". Baseball-Reference.com. 1978-10-06. 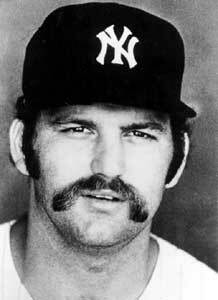 ↑ "Catcher Thurman Munson, The Captain, was heart and soul of the NY Yankees". 2009-08-01. 1 2 Brennan, Sean (2009-08-01). "Jerry Narron recalls night he replaced Thurman Munson for Yankees". New York Daily News. ↑ "New York Yankees 5, Baltimore Orioles 5". Baseball-Reference.com. 1979-08-06. ↑ "Paltry Tribute to a Yankee Lost Too Soon" by Sam Dolnick, The New York Times, April 16, 2010 (p. CT1 April 18, 2010 NY ed.). Retrieved 2010-04-17. ↑ Haitch, Richard (1982-05-02). "Follow-Up on the News; Munson Case". The New York Times. Retrieved May 25, 2010. ↑ "Diana Munson & Goose Gossage at Modell's Grand Central" on YouTube by Katherine Hart, YouTube network video interview, August 06, 2008. News outlets sometimes spell the name Diane, including the NYTimes; however, since "Diana" is used in a recorded face-to-face video interview situation here, the editor has brought all references to that spelling. Retrieved 2010-04-19. Appel, Marty (2009). Munson: the Life and Death of a Yankee Captain. New York: Doubleday Books. ISBN 978-0-385-52231-1.